The following highlights Workcred reports and other initiatives that have relied upon the expertise of Workcred staff. U.S. manufacturing faces a skills mismatch: studies forecast an increase in output and productivity, but also predict a shortage of individuals with the right skills to fill the jobs. To help solve this mismatch and keep up with changing skill needs, a clearer understanding of how credentials are used and valued by the manufacturing industry is essential. 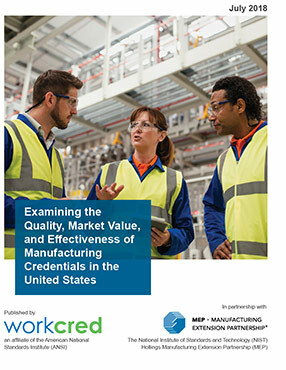 In a first-of-its-kind research study, Workcred – an affiliate of the American National Standards Institute (ANSI) – partnered with the Hollings Manufacturing Extension Partnership (MEP), an operating unit of the National Institute of Standards and Technology (NIST), to examine the quality, market value, and effectiveness of manufacturing credentials, and the need for new or improved manufacturing credentials. The American Legion has released a report, State of Credentialing of Service Members and Veterans, outlining the difficulties faced by transitioning troops in translating their experience from military occupational specialties into credits for credentials and licensing in such fields as truck driving, auto mechanics, and information technology. The report details eight opportunities for action. These include some opportunities that might be considered military-centric in that they are intended to reduce barriers that are unique to individuals who have attained the majority of their occupational preparation through military training and experience. They also include opportunities that are in line with the significant efforts currently underway to reform and add transparency to the civilian credentialing system. Accordingly, a key step moving forward is to ensure that service members’ and veterans’ needs are represented in the many efforts underway to enhance the civilian credentialing system. Workcred’s executive director, Dr. Roy Swift, who held a 28-year career in the United States Army Medical Department, participated as a reviewer of the paper. The National Academy of Sciences (NAS) released a report highlighting expert recommendations on enhancing the quality of undergraduate education, including insights from Workcred executive director Roy Swift, Ph.D. The NAS report underscores the importance of building stronger relationships between educators and industry and addressed major initiatives that serve as solutions for quality education. The report is based on feedback from a December 2015 workshop planned by a committee of the National Academies of Sciences, Engineering, and Medicine Board on Higher Education and Workforce, with funding from the Lumina Foundation. Dr. Swift served on the committee and participated in the workshop, which focused on several major themes including defining quality, improving quality, and measuring and communicating quality. The perpetually volatile economy is increasing risks for employers and job seekers. Within this environment, both are looking to workforce and education credentials to reduce their risk. Employers, seeking the best possible talent, often rely on credentials as signals to screen prospective candidates for the knowledge, skills and abilities they require for business success and competiveness. Young people and adults seek credentials that provide them with valued evidence of their marketable skills to help them secure employment and advance in their careers. The problem is that not all credentials have clearly understood market value. People seek guidance they can trust on the market value of different credentials so that they mitigate the risk of investing their time or money into education and training that will either not pay off with desirable employment or might even detract them from their aspirations. The importance of understandable, reliable credentials as a common currency of exchange in an already complex marketplace is becoming even more crucial.